The long, pointed wings and thin bills of our quiz birds look good for shorebirds of some kind. Since both birds are similar in size, shape, and proportions we can assume that they belong to the same species. Moving on, the bills are too short for a godwit, curlew, dowitcher, snipe, or woodcock. 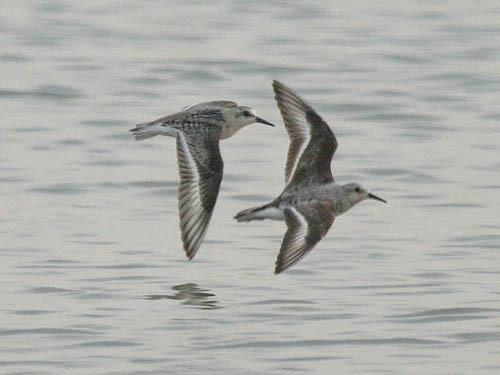 Both birds have bold white wing stripes, a feature that eliminates a number of shorebirds that lack a wing stripe or have only a very weakly marked wing stripe, including the Tringas, Spotted Sandpiper, Buff-breasted Sandpiper, Stilt Sandpiper, Red Knot, Wilson's Phalarope, and almost all of the smaller Calidrid sandpipers. In fact, only a handful of the smaller shorebirds have such a prominent wing stripe, namely Red and Red-necked Phalaropes and Sanderling. Our quiz birds lack the dark eyeline of the phalaropes and are therefore Sanderlings. The pale body color also looks good for Sanderling. These 2 Sanderlings were photographed by Kanae Hirabayashi on August 26, 2006 at Montrose Beach in Chicago.